People all across the planet have reported hearing a strange humming/droning noise at the dead of night usually in their bedrooms like my wife and myself heard last evening. This is a bit off topic but as I am in an industry that makes a living out of recording sound and vision I feel obliged to report this weird phenomena that has occurred a second time over the last two years. I was in the edit suite which is right next door to our bed room when my wife came in and asked me what the humming noise was, it was about 1.30am. I switched off all the equipment and could still faintly hear a low, almost mains hum in our bedroom, it is officially reported to be between 40-80 Hz. I decided to see if the noise was only in the house or outside so we drove round the local area in Burnside, Rutherglen stopping and listening, strangely the noise could also be heard a quarter of a mile up the hill from my house facing south but going the same distance north, nothing. I looked for the obvious train line maintenance or any kind of construction but once again nothing, the same happened about a year and a half ago and we went through the same exercise. 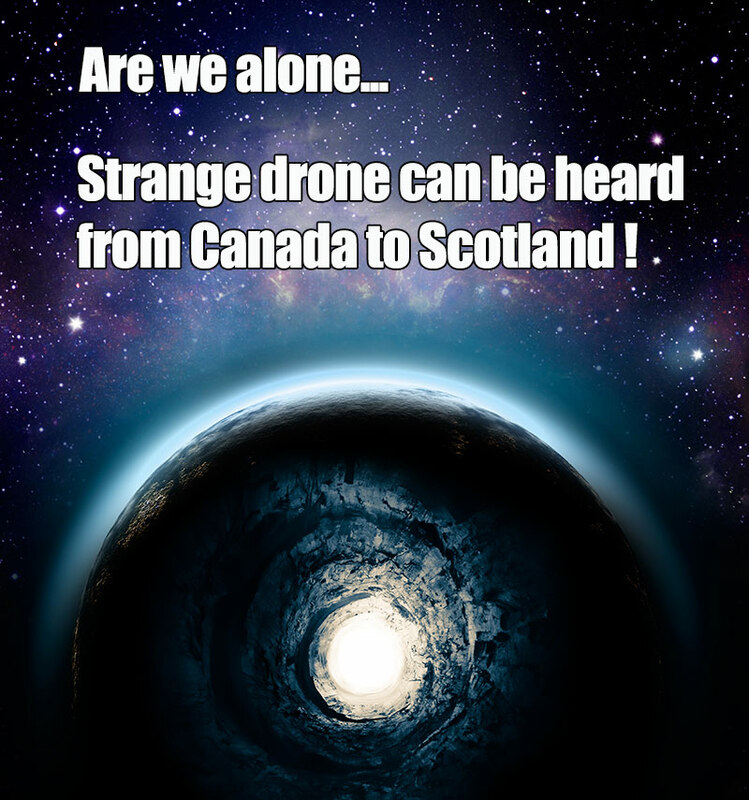 This strange low frequency hum has also been reported from Canada and England all with the same story only noticeable at night, we don’t have any overhead pylons anywhere near us so it remains a mystery. Is mother earth being mined under our very feet ? Editor : Night time is simple…a lot less noise from cars, birds etc its probably in every room but you are more in tune with your bedroom as you spend a third of your life in it and more importantly in the same place i.e.. your position in your bed remains a constant so your ears are highly tuned to that particular space. Ah, just noticed Roslin – UK. i am in the US and noticing that the HUM is much louder in winter months than summer months. anyone else have a similar observance? this has been very invasive and sort of sickening in Mesa, AZ,USA-anything from almost an electric, buzzing feel under the feet-indoors and out- to a head thrumming similar to when a car window is cracked open at certain speeds. My indoor pets (cage free rabbits and birds) have noticed this at times, and so has company- no one can figure it out, or even which direction it comes from.Glad it is not just our imaginations! My experience started in March this year, which is the last month roughly of NZ summer. Been pretty consistent over winter, but less so for the last month to 6 weeks, only one or two really severe nights when the oscillations are faster and seem to speed me up as well! So will be interesting to see if it continues to be less severe through our summer which is starting now. Hi Lynda, Where in NZ are you? I’m in Timaru and have noticed the same as you. I’m wondering if it has a relation to the oil companies with their “fracking”. We’re on the edge of the Pacific plate – I reckon the vibrations from fracking in the northern hemisphere could be resonating through the bed rock. I may be dampened by groundwater levels at certain times of year. Just an idea, Cheers. Found the same thing ,when its 20 degrees plus at night in the summer ,i cant here it ,the colder the whether the louder the noise. Hi, this is the link to facebook group. Fracking has been used for decades before anti progress groups got wind of the attempts to extract from shale gas. There is no fracking, yet, in the UK but many hum reports so it isn’t that. The link to mains frequency may be key but many other possibilities exist. The link to temperature maybe points to an internal problem: is warmer weather changing the viscosity of the fluids etc in the ear? B flat – which one?! Richard: Fracking is definitely happening currently in the UK. Although it’s kept very quiet, it’s happening in Northumberland right now. Very few people are aware other than the landowners. They have a 3 year contract which I believe is coming to an end.. Interestingly it’s 3 years since this started for me. We also have an abundance of turbines, more than anywhere else in the UK – definitely another suspect, and until I heard about the fracking they were my primary suspect. Air temperature will allow the sound to propagate differently, I’m pretty sure we don’t hear the actual LFN from the source, but the effect on the structure of our surroundings – hence why we tend not to hear outside even when otherwise quiet. Electromagnetic radiation detector goes mad when testing walls of the bouse when the hum is at it’s worst. These are my findings, and believe me I’ve travelled many miles to find the actual sources. The fracking operation I need to look further into, and I’ll try and get some pics too, though that could be difficult due to it’s location and the nature of their operation. There are few locations in Europe where this is not heard, most of the UK seems to be pretty much saturated. Of late it has increased massively, whether this is temperature related I can’t say 100% but the past 6 weeks has been pretty bad. My old house had it 10x worse. Thank God I moved, I can think again! Hi Lynda,The fracking theory might be a bit far fetched. The hum has been particularly loud over the past two nights here, however Friday & Saturday nights were silent – bliss. I could even hear the 3am freight train moving off from the station heading north. I live approx 15km from there, that’s how still and silent those nights were – just like the old days. Whatever the cause of this annoying hum is, seems to be worldwide. Its the lower b flat. It is not the same noise as water pressure in pipes as ive checked. It goes on mainly aswinyer begins and seems to stop In the spring. I have also noticed a wifi address on my wifi list called CDFN. I have had a little look online and it seems to be an experiment in frequencies haptic feedback and space exploration or something. it might be something to look into. Steve, fracking has been going on since 1947 in the UK, the current kerfuffle is over shale gas fracking. My third paragraph should have been in accord with my first two thusly: “There is no shale gas fracking…”. The final arbiter is measurement: get someone to do an audio spectrum analysis. Until you’ve done that all is speculation. Btw, I have been unable to find anything about ongoing fracking of any kind in Northumberland even on loony green sites. L – those links are not relevant: they are receiving data not sending it. L – “lower B flat” – as I said, which one?! There is a B flat just above the A often used in “concert pitch” tuning forks at 440Hz, this B flat is at 466Hz. By simple division by two (an octave) we get B flats at 233, 116.5, 58.25 and so on. I suspect you mean 58.25. This is very close to UK 50Hz mains frequency which could easily be modulated by harmonics to sound a tad higher to the ear. Look, first, for a 50Hz mains source. Yep, I think a lot of it has to do with sound waves traveling underground. I once lived near a large hospital that used huge turbines on furnaces when heating. I could hear the noise inside my house blocks away, but not outside. A lot of it also seems to be around 60 Hz. in the states from I think underground electrical lines. My current house is built on a cement slab and sometimes I hear the noise inside the house, but nothing outside the house. It seems to come from large boats idling in the waterway. Then find an anechoic chamber, step inside and shut the door. if it’s still there it’s unfortunately internal. tamura, set up a small fan in the bedroom, or a noise machine. its the only thing that’s given me any relief from the hum at night. I use an air purifier set on low which creates sufficient white noise to mask the hum, and which at the same time purifies the air. I think that’s a better option for me than simply using a fan, although it’s a matter of individual choice – what works for one person might not for another. I think you’re on to something when you suggest the hum is worse in the wintertime. I definitely notice it then. I agree that a fan or air purifier is the best solution to mask the problem. I just woke up to this strange sound this morning and it is a humming sound which gets slightly louder then quieter. Its now been going on for nearly an hour that i’ve heard anyway. I live in east kilbride Glasgow. I’ve tried recording it but my phone won’t pick it up. It’s posible that your phone isn’t sensitive enough so you need to try another recorder first. If that doesn’t pick it up then the hum is likely not airborne but is internal. It isn’t so much that the phone isn’t sensitive enough in terms of dynamic range, though possible as the hum may be very low volume, but more relevant in that of frequency. The hum is likely to be below the minimum frequency tolerance for the microphone. Special microphones would likely be required to record sounds of very low frequency. If you can “hear” it it will almost certainly be above 18 to 20Hz and any decent mic should pick it up but maybe not a phone. I’d get environmental health in with good gear – ask what model mic they use then Google for its frequency response. Naturally, anything recorded can be analysed for level as well as frequency. Exactly. The phone is not capable of recording low frequency sounds. You need specialised Low Frequency equipment. If you can, get your council to come and record it. Record over a period of time so you get not just the noise, but any humming and, importantly, periods of complete silence, for comparison. I live in Idaho in the United States, over the past few days I have started to hear the “hum” it starts out quietly like a neighbor working a vaccum, and progresses till it is louder like the vaccum is in the room. My husband and I have stepped outside (we hear it at night 9-12ish, and in the morning 7-9ish) one morning and it was definitely coming from outside! It was so spectacular, we had no idea what it was from. Being musical talented I would say that it would be a B flat just like everyone has been saying on this forum. I am now listening a hum noise. I am scared so I am not going outside to check. I heard it yesterday too when I woke up around 4:00 a.m. I am really curoius to know what is it. I live in western Washington and heard a really loud hum today at 1:30 PM. It sounded like the old plastic corrugated whirley toys & sounded like a Bb to me. When I heard the hum you could hear no other animals such as birds chirping etc.. It was really odd. Any thoughts? I’ve had tinnitus since a teenager. This is not the same at all as you have also said. This is a low frequency hum, here in the states about 60 cps. I used to think it was the pleasure boats in the canals here idling their engines at night, maybe some of it was, but I think I have narrowed it down. We are all fully on the electrical mains here, electric heat and everything. It has been cold recently, so most have their electric heat on at night when it really cools down. We all have underground electrical mains feeds to the houses. I realize this might not be the same out in the country, but just describing what I think it is here. I’ve heard this hum here from time to time, same as others have discussed where they are. I’ve tried to isolate it, nothing outside, turning off all utility feeds to the house, still the same, hum continues. I’ve decided here it radiates from the ground and is picked up by the cement slab this house is built on. I can hear it in one part of the house if I put my ear against the dry wall over the cement walls. Long story short … I heard it a couple of nights ago but only in one part of the house adjacent to the next house. There are utility transformers out in the center island, and then underground feeds between some houses which serve numerous houses. There is one underground electrical feed between my house and the adjacent house. That feed runs on down between houses and serves numerous houses. Here is what I think happens. At night there is a tremendous load on the mains with all of the electric heat on in the neighborhood. I think that sets up a classical 60 cps vibration whine in the mains. Then, this area has limestone starting about 1.5 feet underground. No doubt the mains are on the limestone encased in conduit and probably cement on top of them for protection. So, I think the 60 cps vibration hum is transmitted to the limestone under the house and then that vibration is transmitted by the limestone to the foundation cement slab under the house, and then radiates into the walls in that one part of the house. It is a very positional hum with standing waves. If one tilts the head, moves one way or another, it goes away, move a bit more and it comes back. Here is what I have noticed this winter, and then thinking back to last winter, I’ve only heard it at night in the winter, which is when the greatest load is placed on the electrical utility mains in this area. Recently, it has warmed up at night and the hum is gone. I realize this is not likely applicable to where you are out in the country, but wanted to share what I think is likely the source here. I’ve not mentioned this to my neighbors as I’m new here, one year, and some would likely think some type of nut moved in if I started talking about humming noises at night from the ground, etc. From your description it seems internal. Check to see if there is an electricity substatio near you. It;s easy to find, go to Google Earth, find your home then search for electricity pylons. Track them along until you find the substation. Then go there when youhear the noisein your house and see if you can hear it outside the station. You can hear it better if you are wearing earplugs or sitting in your car with engine and heater off. You can also do the usual things of switching off all power in your house to check its not your heating fridge etc. Let us knw what you find. I’ve been able to hear it for idk how many years. I live in Ohio, but I only hear it in the dead of night. In fact, I hear it now. It’s 4:15am here. Which is what brought me here because I’m curious what it is. I can hear it over my t.v. so it’s not just in dead silence. It’s strange because I was sitting here watching t.v., and randomly around 3:30am, the noise began out of no where. So it’s not as if the noise is always there. I only ever hear it around this time. It makes me not want to sleep. Like it makes me paranoid. I hope someone can find the meaning behind it. It’s freaking weird and I don’t like it. I like in North Lincolnshire in England and I have been hearing this. It sounds more like a whirring noise, similar to a dentist’s drill but calmer and a lower tone, or like a hoover in the distance, and it has been happening during not only night time but during the day, as well; and since I have trouble sleeping, with this it’s impossible. It’s not that loud, yet when I cover my ears I can still actually hear it, and like I said it’s impossible to sleep unless I’m completely exhausted. The sound seems to get louder and quieter randomly, as well, and as of today the 22nd of January 2015 I think it has been going non-stop for a couple of days – including during the day. I’ve also heard other things similarly, such as a low bleeping noise which repeats but I thought that that was just a toy or device or something. Cheers Bert. I have put the link on the low frequency hum sufferers page on facebook. Other useful and interesting info on there too. That’s a very useful list for those who hear the noise. I note that he is very clear that if a sufferer hears the noise away from home and others can’t hear it then it is internal to them; I have always said this and it cannot be emphasised enough. I would add that a good audio recorder should also be used perhaps with a parabolic microphone reflector. If a recorder doesn’t pick anything up the noise is internal. Even when I had low blood pressure I could often hear blood pumping through my ears. It’s easy to train people to recognise this effect. I must disagree with the idea that if a sufferer hears the noise away from home and others can’t hear it then it must be internal to them. This just isn’t the case. It’s a well-documented fact that low frequency noise/vibration affects only a small percentage of the population and that most sufferers may be the only family member who can actually hear/feel it. Also since LFN travels great distances without much attenuation it’s very reasonable that sufferers can be affected by the same source many miles away and even when they’re outdoors. This is how it affects me and I’m sure it’s not tinnitus because my problem only started the minute a large new paper mill began operation within a mile of my house. I now live 12 miles away but am still badly affected. Also I’ve previously suffered from occasional bouts of tinnitus and LFN isn’t the same – I can distinctly tell it’s external to myself. I’m interested in what Bob said: “The sound seems to get louder and quieter randomly, as well, and as of today the 22nd of January 2015 I think it has been going non-stop for a couple of days – including during the day”. I’d be interested to know Bob whether your observations agree with mine. My observation is the same as yours for the 21st and 22nd of January, but would you agree that today (Friday 23rd Jan) the sound/vibration is less intense than the previous two days? If no-one else can hear it and it cannot be recorded it’s internal. NO Mardler. You are wrong. You don’t appear to suffer from LFN yourself in which case you’re not speaking from personal experience. Also I think you may be confusing ordinary audible hums which everyone can hear with the particular problem of LFN which is very low in tone and which most people are unable to hear.